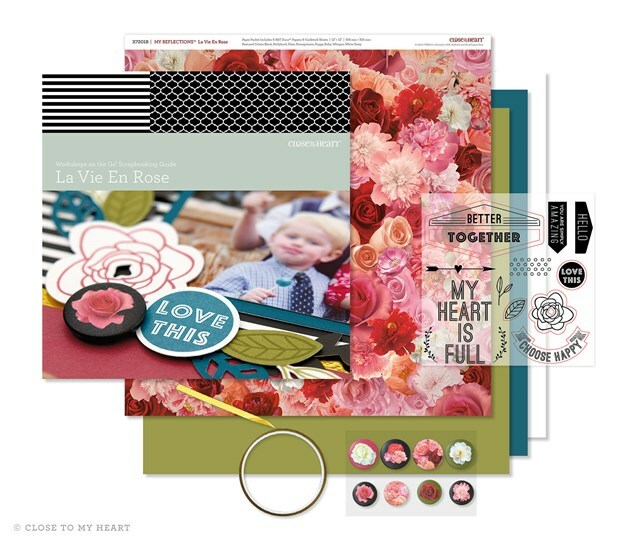 If you are coming from Catherine's Blog, you are on the right track. Should you get lost along the way you can find a complete list of participants by clicking here. 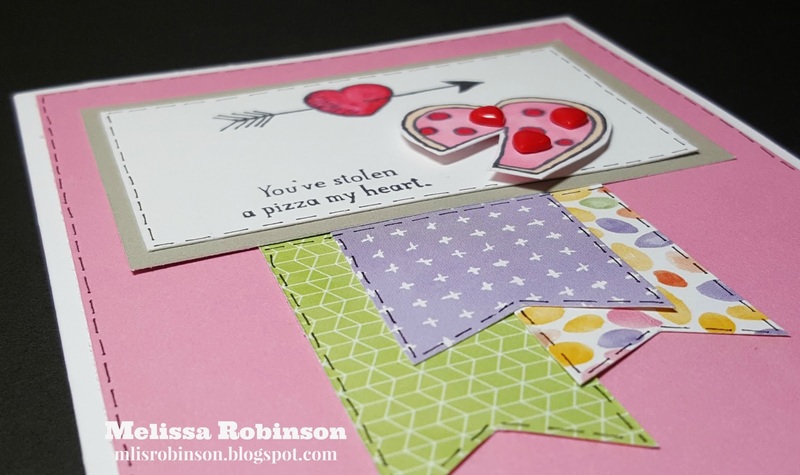 The card I created contains a few favorites right now. 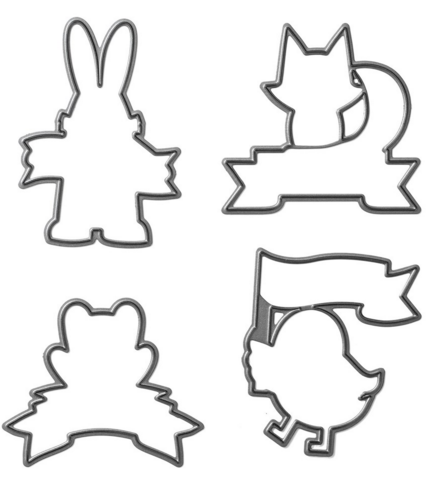 Can you guess what they are?! 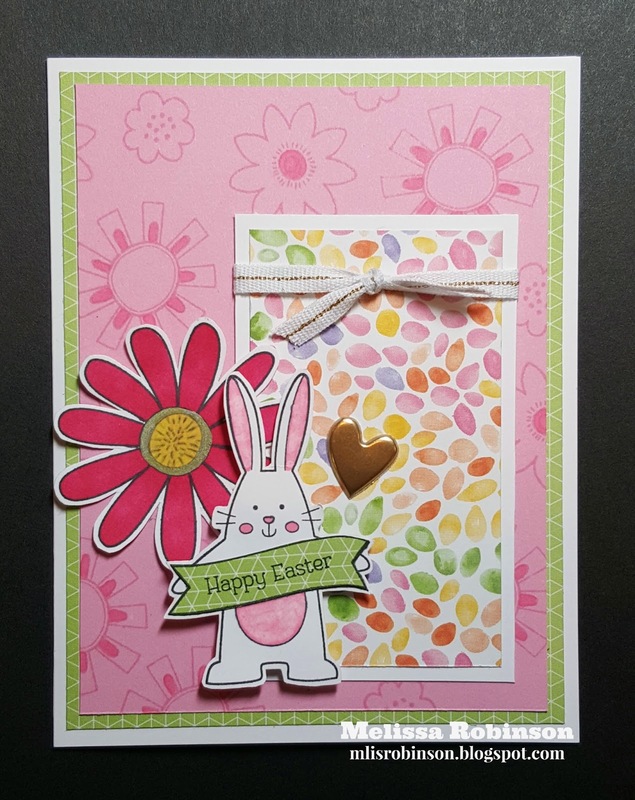 The papers and colors from the Kaleidoscope paper pack scream Easter/Spring to me so I chose to incorporate them. I also random-stamped a piece of Pixie cardstock, using the fun "Friend in Me" stamp set (pictured below) which is also where the 3-D floral image is from. 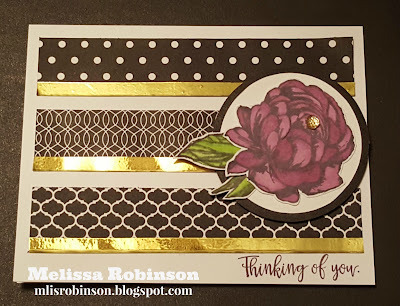 I colored it, and shaded the tone-on-tone flowers, with our ShinHan Markers and also used our Metallic Gold Marker for a little accent on the flower center. I had never used it before but don't tell anyone! I can tell it will get some good use now. The bunny was stamped using the Spring Critters stamp set. I paperpieced the bunny's banner by stamping the image again on the Pear patterned paper, cutting it out and gluing it on top of the original image. Too fun, right?! The bunny was colored in using the Light Pink ShinHan Marker and the lighter areas were generated by using the Color Blender Marker which I love! 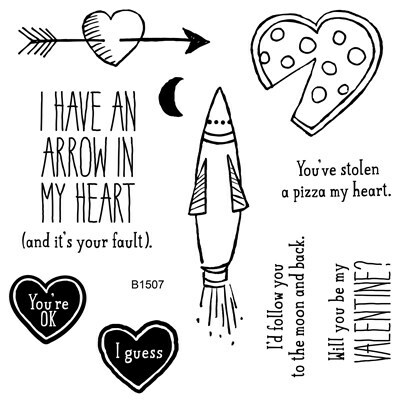 If you do not know why these images have a blue outline around them it is because they can be cut using our new Thin Cuts! (We have four sets of them that were released at the first of the month.) 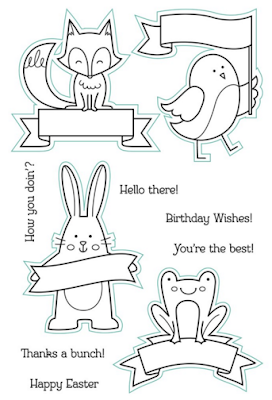 Place the image on your Cuttlebug or other diecut machine and crank them through. Then use the stamps to create the image that you can decorate as you choose. No fussy-cutting required! Bling is always a necessity on every piece of artwork so I include some White and Gold Ribbon and Gold Heart Puffie. They were the perfect finishing touch to this happy card! 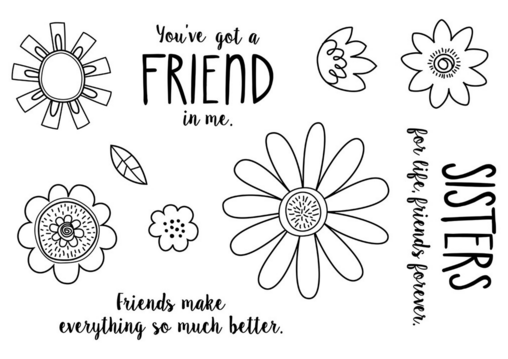 This is the Friend in Me stamp set. 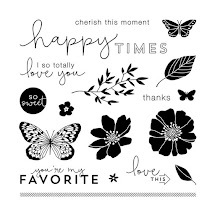 LOVE the sentiments and flowers and even if you do not have a sister like I do, it is very versatile! I cannot wait to use it on other creations! Thank you for visiting my blog. Let me know what you think about my card creation. I would totally appreciate it and then head on over to Tammy's Blog to view her artwork. 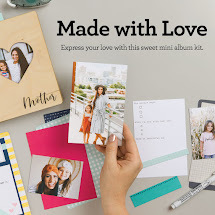 Check out this fun video, led by my friend, Monica Wihongi (our COO), for making an adorable handcrafted mailbox for Valentine's Day. It is perfect for sticking in some chocolate or other small goodie. 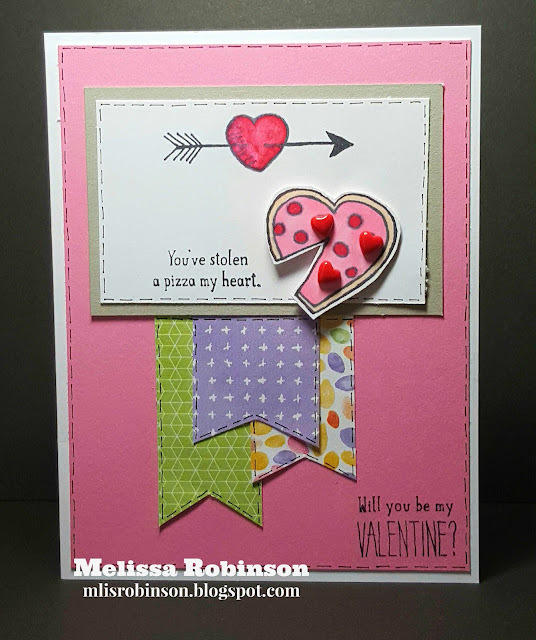 Gotta love when you can create something by hand that has a lasting impression but requires little time and money! 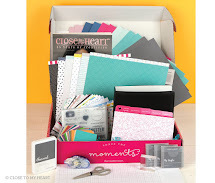 This video was pulled from My Craft Channel where you can find a lot of fun videos with papercrafting projects and techniques, to include those from Close To My Heart! It's Friday eve! Make it a great one as you gear up for the weekend! 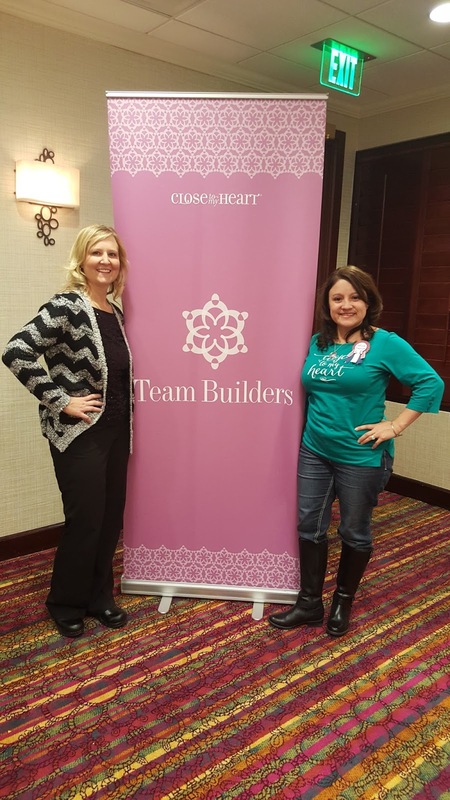 Last weekend I was blessed to attend Close To My Heart’s Team Builder’s Conference in Salt Lake City. It was a fabulous time spent with top leaders in the company. 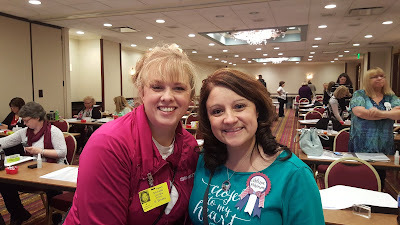 I love attending CTMH events but these and some others are fabulous because of the small and intimate setting. It truly allows for great networking with fellow Consultants and the home office staff. 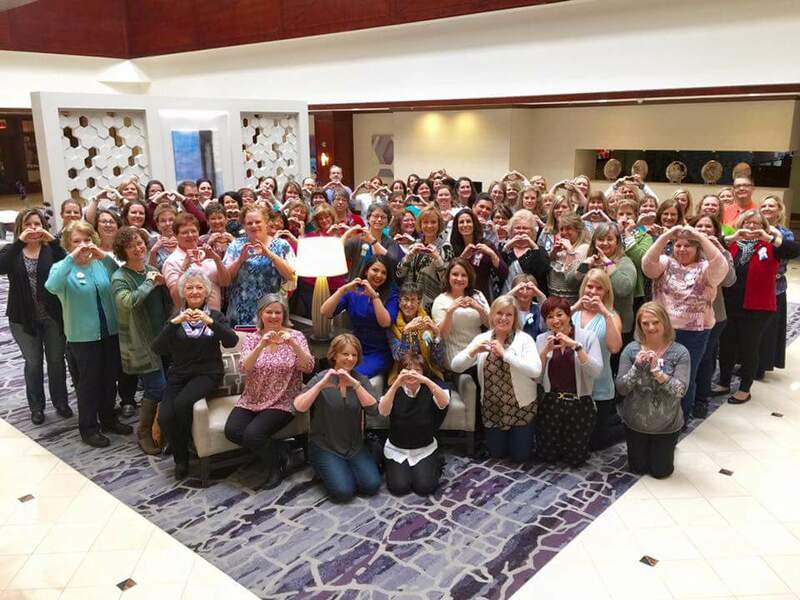 This is a fun photo of all who attended, holding up hearts, of course. We enjoyed 2 ¼ days of training filled with both business and creative classes taught by staff members and consultants. The information shared was practical and I am excited to plug them in to move forward in continuing to build a successful business while supporting my team members. 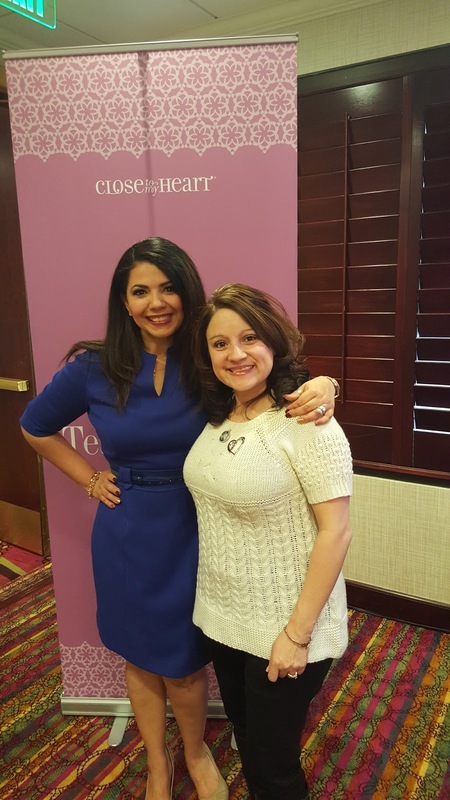 It is so fabulous to be close friends with the Executive Team. This is Monica Wihongi who is the Chief Operating Officer for CTMH. Love this lady tons! This is me with my upline, Michelle, who has been a blessing with my business. 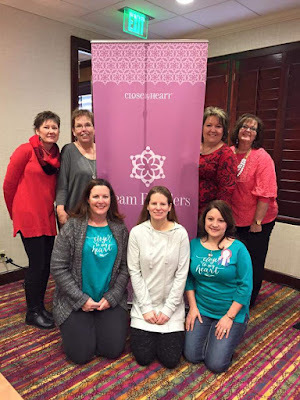 I am part of this team called Stampers with an Attitude led by Kimberly (in the black and red top on the right). These ladies are members of that team from all over the country. I am in Kim's second downline. 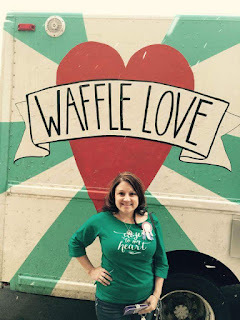 One of the highlights of Salt Lake, and almost a trademark of CTMH, is Waffle Love. It is a mobile food truck that joined us at the event on Saturday afternoon. We stood in line while it was snowing ( a perfect setting) and placed our order for a waffle of our choice. There are many yummy ones to choose from and we were treated to them by CTMH. Isn’t that wonderful?! It was awesome and so tasty; definitely a special treat. You can see the snow falling if you look closely. 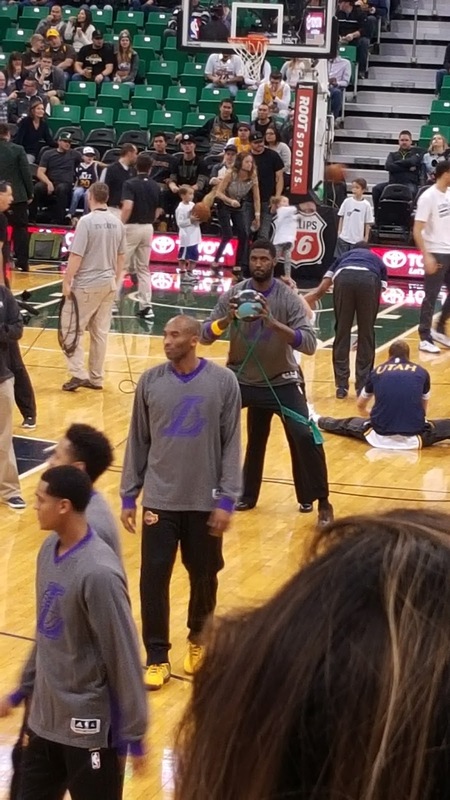 Love that it was caught in the photo. 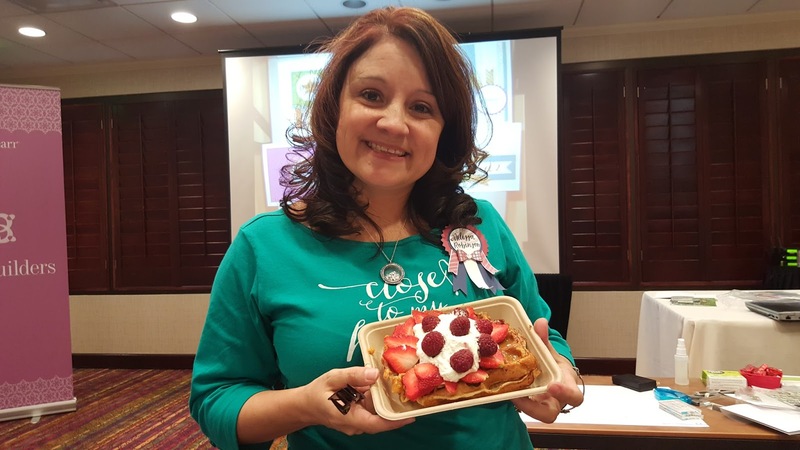 I love being able to attend trainings like this – that allow me to visit places throughout the country for a few days – that are write-offs for my business. Yep, you read that right! My flight, hotel, food, etc. is all a write-off on my taxes because they support my business. Isn’t that awesome?! Just another bonus for being a Consultant for a company that I love and believe in 100%. 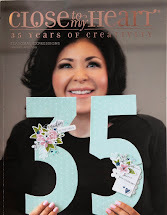 This is another dear friend who admire, Tiffany Young, who is the Events Manager for CTMH. 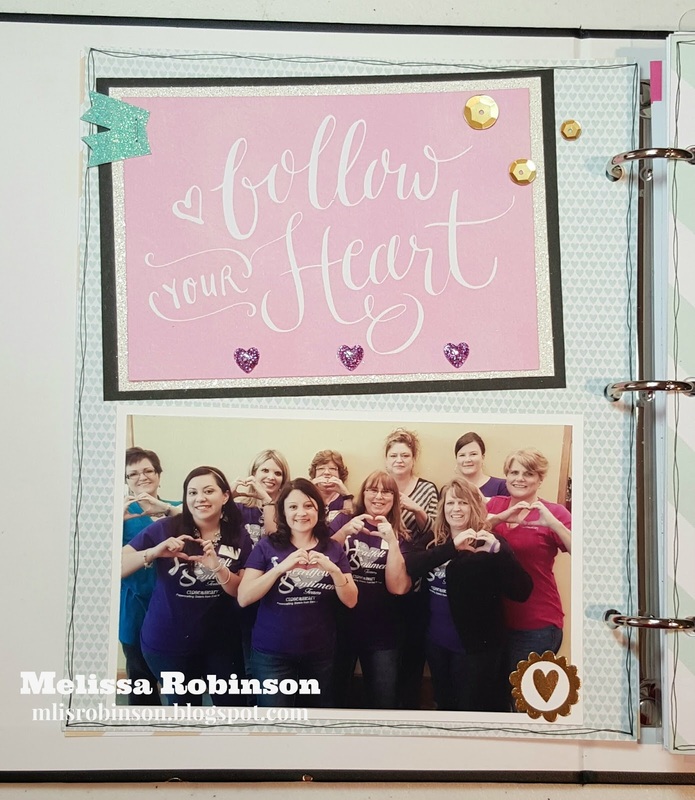 If you would like to join me on this fun journey, contact me today! 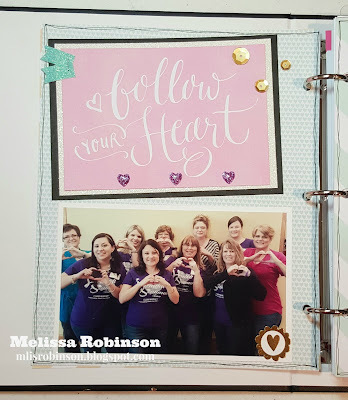 I am looking for some new team members who I would love to support whether you do so to save money on your purchases or want to make this a part or full-time business. That decision is totally yours! You can click HERE for details regarding our Consultant kit. 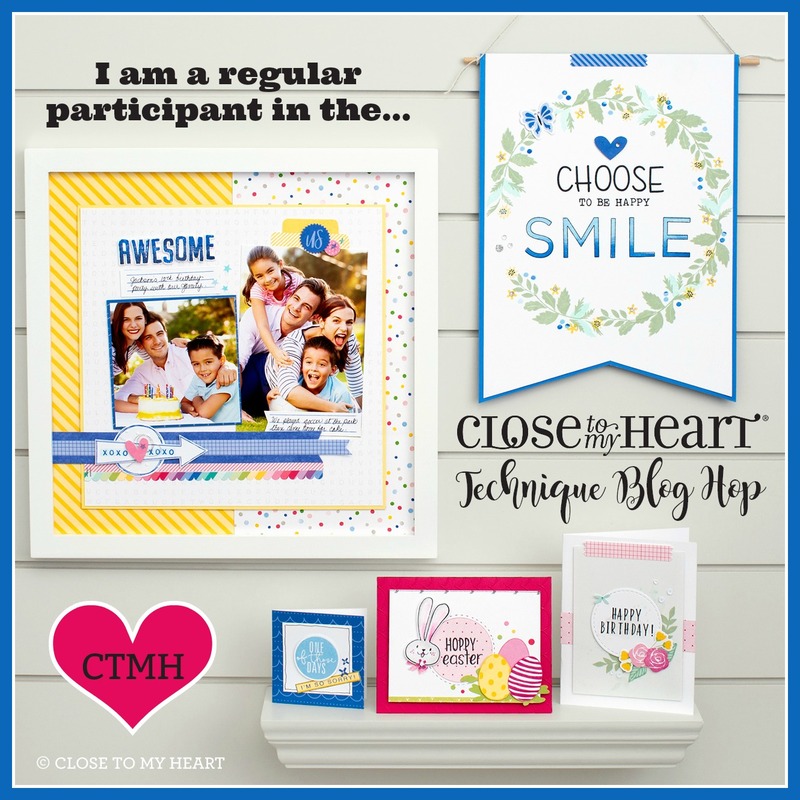 It is great to be home but I had a fabulous time and look forward to having a successful year with CTMH and am gearing up for another training in Houston on March 19th and Convention in Walt Disney World in June! Why not join me?! Thank you for joining us for my Team Blog Hop where we are featuring this month's Constant Campaign, Live Your Day. 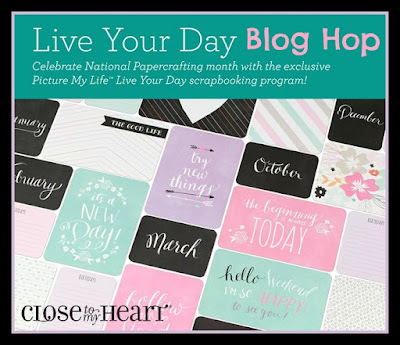 We are not done celebrating National Papercrafting Month and are doing so with the Picture My Life Live Your Day scrapbooking program, only available for 11 more days (through midnight MST on January 31, 2016). 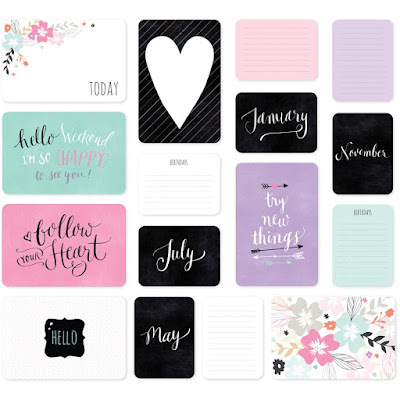 These fun cards are great for inserting into your Everyday Life Planner or can be translated into cards, scrapbook layouts and truly, whatever else you desire. 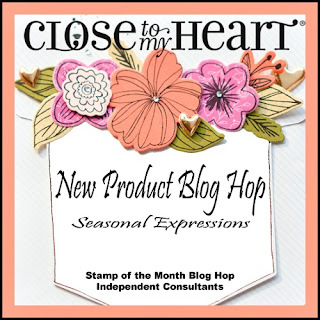 If you are coming from Sheila's Blog you are on the right track. You can find a list of hoppers by referencing the list at the bottom of this post. So...let's get started! 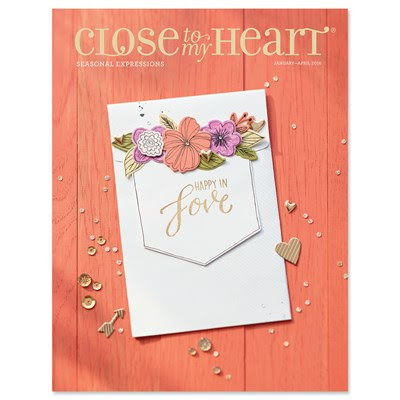 The base of this artwork was created on one of the fabulous pages of the My Crush Everyday Life line that coordinates perfectly with the Live Your Day cards. 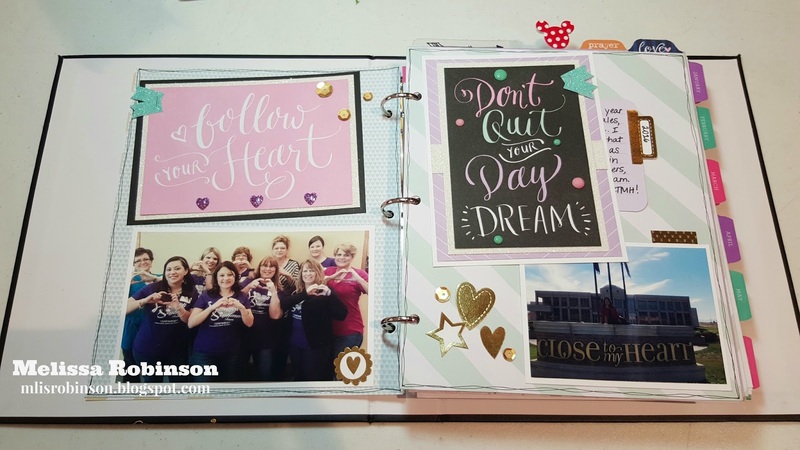 The sentiment was cut out of our Cricut Cartridge and then backed with Purple Glitter Paper. 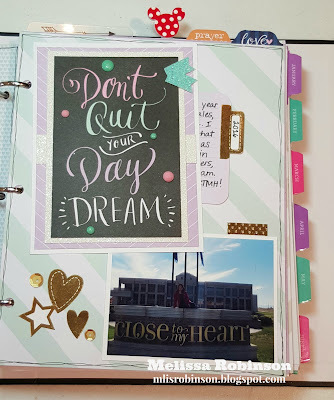 Believe it or not, and you will see below, the ribbon "flags" were cut from the bottom of one of the other cards and the little journaling spot was trimmed down to highlight a special moment from a happy day. I think I am ready to add my thoughts to it now. 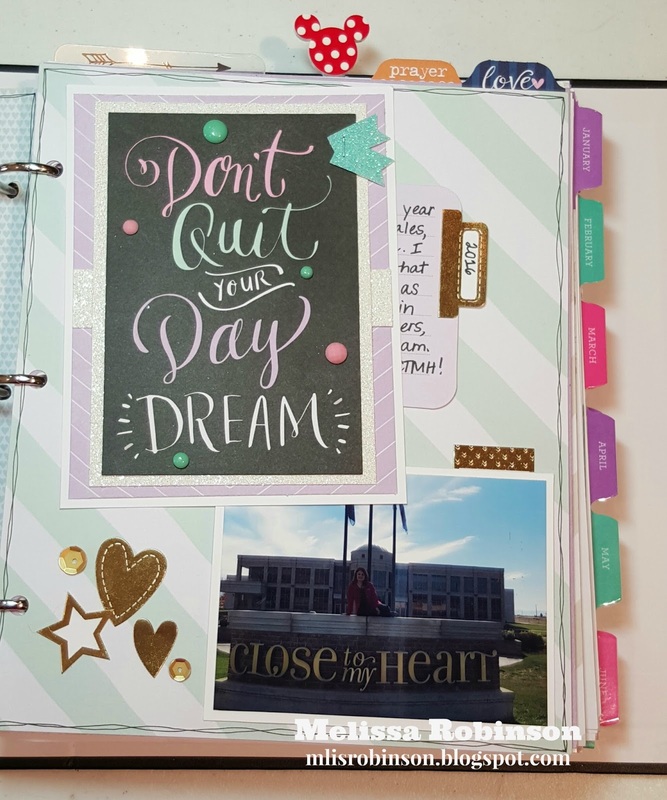 Here is a photo showcasing the card where the "flag" was cut and the letters cut from the card that can be used on another project. Thank you so much for stopping by and now head on over to Scrappin Katy to see what she has in store for you! 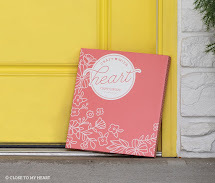 Thank you for joining me for another week of Heart 2 Heart Challenges. This week our theme is, "By the Numbers", which is pretty self-explanatory but wide open for interpretation! 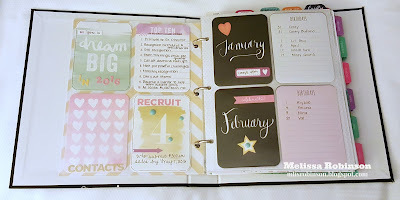 I used some of our Picture My Life cards to create this spread in my new Everyday Life Planner. The Picture My Life Through the Year scrapbooking products were used to create this left page. 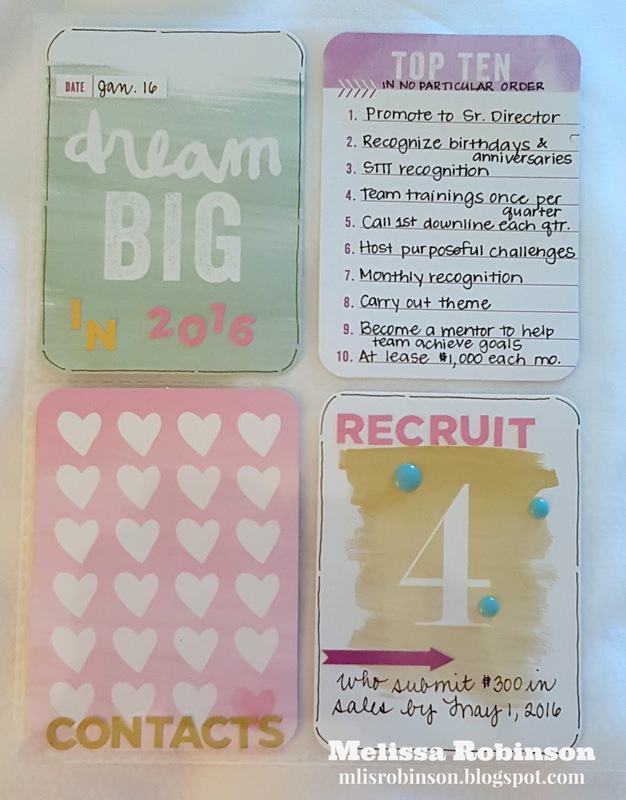 The cards are so fun and colorful and are perfect for setting some business goals for 2016. Whimsy Fundamental Stickers were used to spruce them up a bit more. Aren't they too fun?! And I couldn't resist adding some Enamel and Glitter Duos Blue Dots (these are one of my favorite new products). 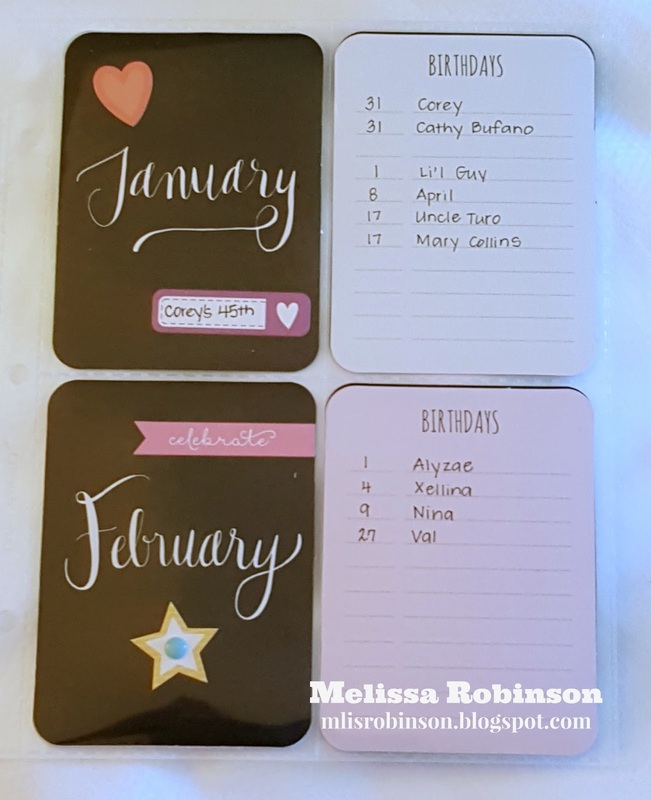 The right page contains pocket cards from this month's Constant Campaign, Live Your Day, that are perfect for remembering birthdays for each month of the year. Some of the stickers were added for a pop of color. Gotta love having all the important stuff in one place! We would love for you to share your artwork with us, incorporating Close To My Heart product, that aligns with our theme. 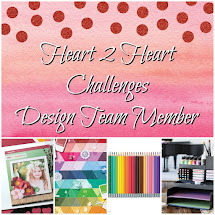 Just head on over to Heart 2 Heart and upload your artwork to our Linky. It is always so much fun to see how everyone interprets the theme. Have a great week and Make It From Your Heart! In our Technique Blog Hop this month, we are featuring the Bokeh Technique. Have you heard of it? It is a fun technique associated with photography. Search it on Google (or other search engine) and check out the images you will find, like the one used in this image above. I think it's just beautiful! There is a way to recreate it with inks so nine of us have gathered to showcase the technique on our artwork. 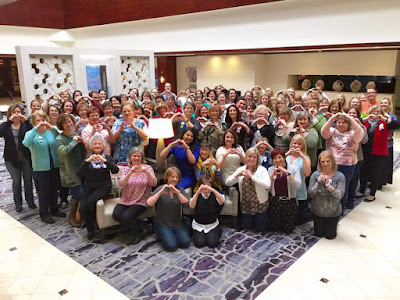 If you are coming from Helen's Blog, you are on the right track. You can find a complete list of participants below, if you were to get lost along the way. Realizing you will see some videos and tutorials during the hop (you can also search for them on YouTube), I am just going to get started, showing you the card I created with this technique. I did choose to keep my card simple, not wanting to take away from the technique. I struggled with adding more but settled on these sentiments from the January Stamp of the Month, "Beloved Bouquet", and a few Enamel & Glitter Duos Blue Dots. I cannot wait to see what the other ladies did with theirs! I used three shades of blue ink - Crystal Blue, Sapphire and Pacifica. 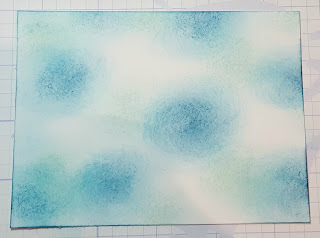 This is the second time I have tried the technique and have found that I enjoy applying the ink, with a Sponge Dauber (rather than a sponge because I am able to control it better - and do not get my hands messy). I prefer to do so in a circular manner and started with the lightest color first. 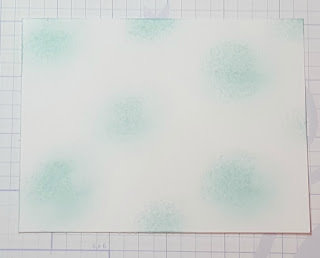 You can see where I applied some of the Crystal Blue ink in a triangular fashion over my White Daisy cardstock. Then I applied Sapphire ink, filling in some of the space but allowing for my last color, Pacifica. The photo I took of the last step ended up blurry and I did not realize that before finishing my card. I chose to have my colors lighter than I could have and will apply more ink on the next creation I made with this technique. 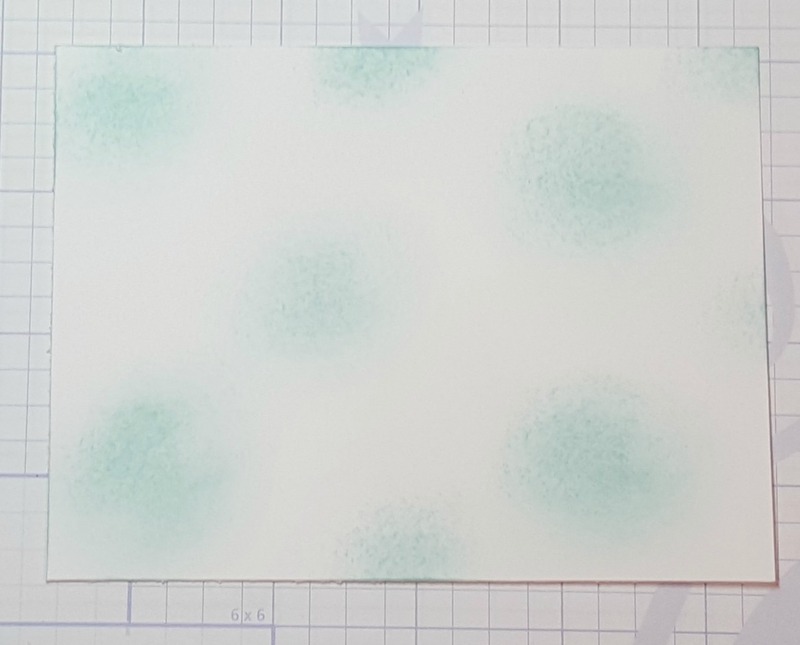 You should allow the ink to completely dry, and it does not take long, so you do not end up applying blue color to your White Daisy Ink Pad. If you do not own this ink pad...GET IT! 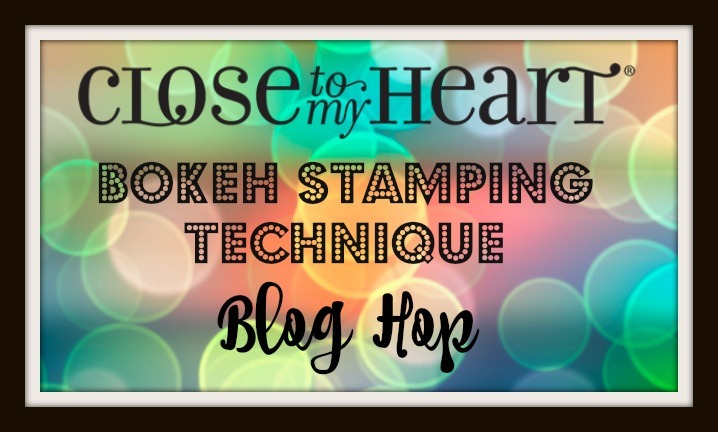 It is fabulous and is fun to stamp as designed or to use for techniques such as this! 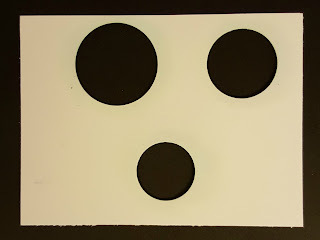 On this scratch sheet of cardstock, I cut circles of various sizes. (Tip: I would suggest cutting them more towards the middle of the paper so you do not have to be too careful to apply ink off the edge of the cut.) You just apply White Daisy ink, allowing it to dry in between layers, if you would. Doing so makes for a brighter white and you vary the brightness on the background. Too cool, right?! So let me know if you have ever tried this technique or plan on doing so on a creation in the very near future! What colors will you use?! I would love to know your thoughts! 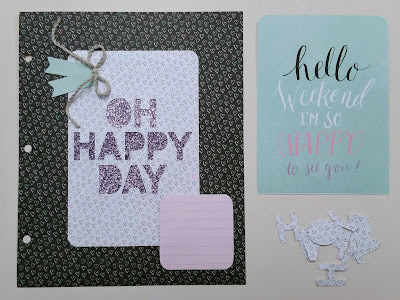 And then...head on over to Catherine's Blog where I am sure she will wow you! 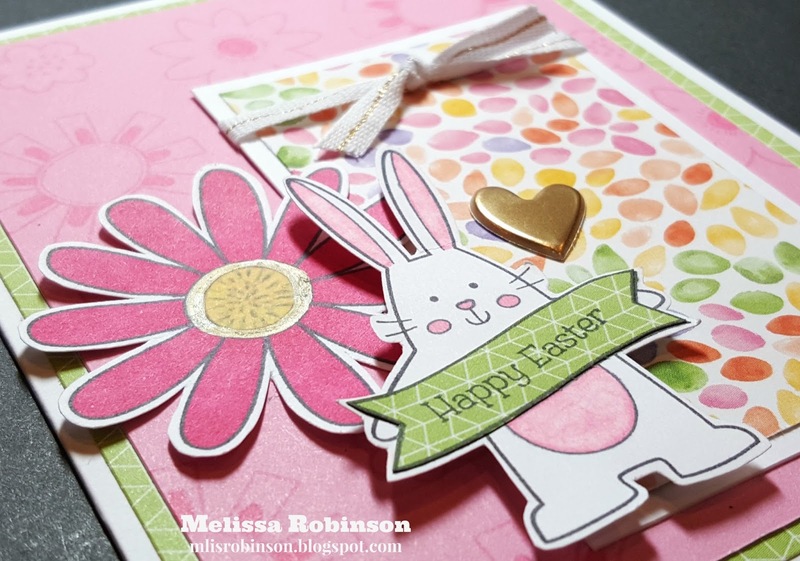 Thank you for stopping by and happy hoppin'! 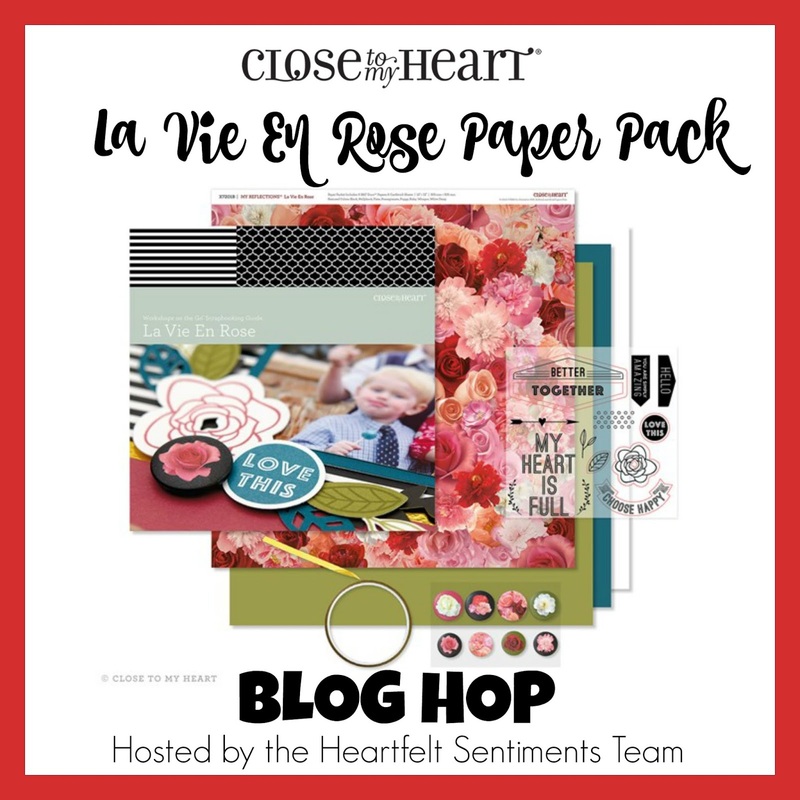 This month, team members with the Stampers with An Attitude Team with Close To My Heart are featuring artwork with the beautiful La Vie En Rose paper pack. If you are coming from Kimberly's Blog, you are on the right track. You can find a list of all participants by clicking here if you were to get lost along the way. 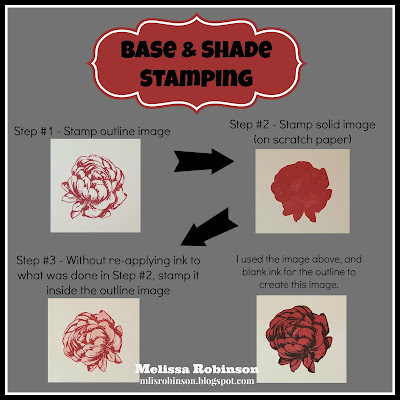 The roses were stamped with Hollyhock, Black and Pixie inks using second generation stamping that is perfect for our base 'n shade stamps. 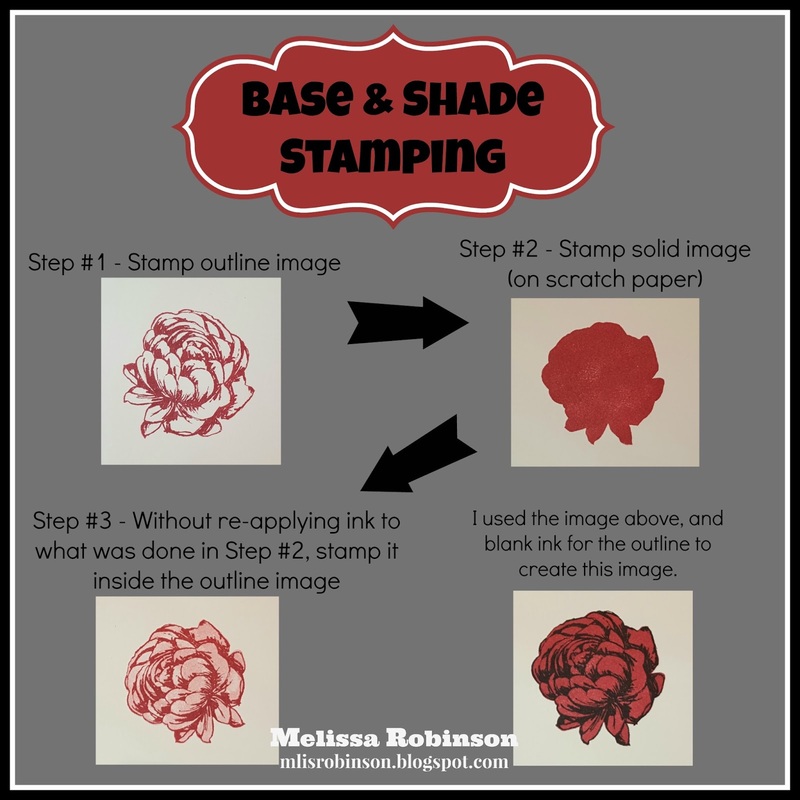 It is called second generation because you get a lighter hue of the stamp pad by stamping the image on scratch paper, lightening the second image. I have provided a visual below to show you how simple this is. It generates such fabulous results with little effort. 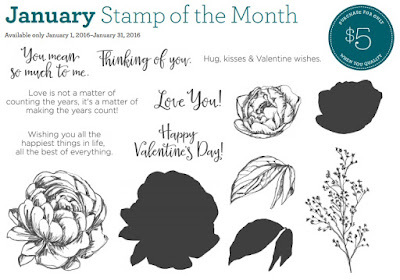 I love it and this stamp set which is our January Stamp of the Month, Beloved Bouquet. 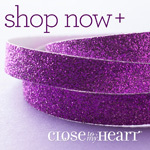 It's only $5 this month with a $50 purchase! I appreciate you stopping by and hope you have been inspired by something above. Now head on over to Sheila's Blog to see what she has created with the La Vie En Rose paper pack. If you are coming from Lisa's Blog you are on the right track. There is a list of participants at the bottom of this post if you were to get lost along the way. In keeping this card simple, I cut three strips of patterned paper and added stripes of Gold Foil Tape for that additional pop. 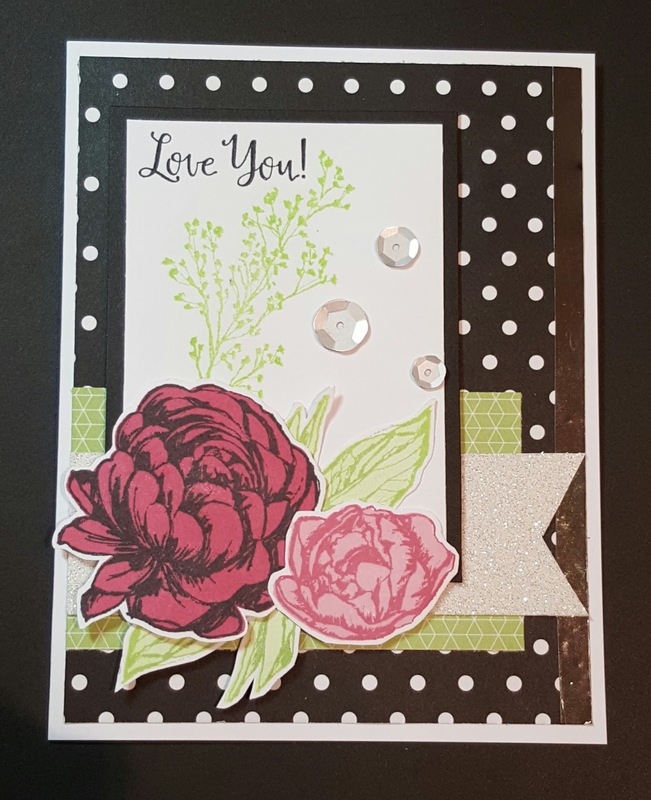 Black and white circles were cut and layered in order to allow the flower and leaves to be more visible on the card front. ShinHan markers were used to color the images and a Bling Gold Gem was placed as the center of the rose. The motto of my artwork is "cute and simple". I like for them to come together easily and have visual appeal. Here is a photo, with different lighting, so you can better see the foil tape. 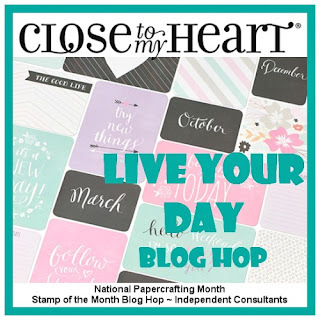 Thanks for stopping by and now hop on over to Katy's Blog to see her fun artwork! She never disappoints!